It’s 6:30 a.m. on a cold November morning in Albuquerque, NM. 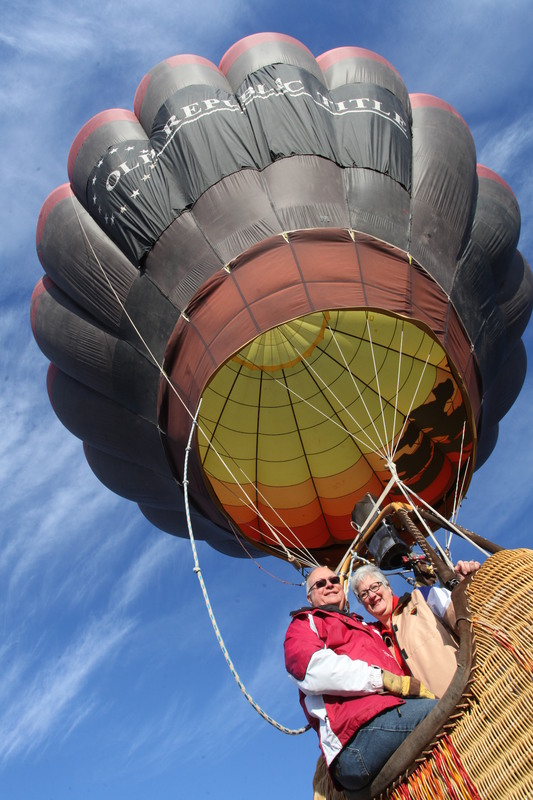 Lyndi Dittmer-Perry, her balloon-pilot husband, Jim Perry, and their six-person hot-air-balloon crew are gathering in the Albuquerque International Balloon Museum parking lot. Everyone has a job to do to get this balloon airborne, and the crew works together like they’ve been doing this for years – because they have. Jim and Lyndi both graduated from Iowa State but didn’t know each other then – Jim graduated in 1967 with a degree in electrical engineering and Lyndi in 1983 with a degree in industrial administration. In 1994 they met through mutual friends in Albuquerque and, after a short courtship, were married in a balloon-themed wedding in Telluride, Co.
“It was adventuresome,” Lyndi says. Jim is retired after spending 32 years with Sperry Flight Systems/Honeywell in electrical engineering and avionics. Lyndi is the owner of Blue Side Up, Inc., a project and program management company. Their passion is hot-air ballooning. Jim started out as part of a crew in 1991, got his private pilot’s license in 1992 followed by a commercial pilot’s license, and has been flying ever since. “It’s an expensive hobby,” he says. “The saying is, ‘The first ride is free; the second one is $30,000,” Lyndi jokes. And now, here we are, still in the parking lot. The sun is up, the sky is blue, and it’s time to go up, up, and away. The crew has worked hard to get the balloon ready for Jim and Lyndi to fly. So what do they get in return? “Jim pays us in breakfast,” they say, laughing.